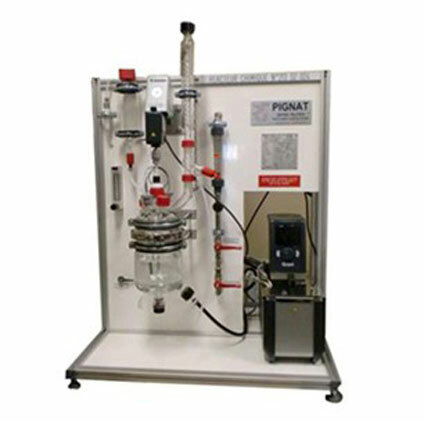 Provides a small volume reactor (1 L) for studying chemical reactions with various parameters. Isolate the product, calculate the yield and analyse the purity. • Glass tank, double jacket, 1 liter. • Torion type drainig valve. • Tap for Pt 100Ω Pt temperature probe. • Nozzle to the glass condenser. • Glass condenser with an internal coil. • Electronic display and control of the bath temperature and of the temperature by an external probe (reaction medium). • Temperature : 20°C to 150°C. • Heating power : 2000 W.
• Group volume: about 4 L.
• Adjustable speed motor 0 to 500 rpm. • PTFE shaft and mobile. • Float type flow meter. • PTFE flexible and nozzle. • Vent above the condenser. For a complete product data sheet and a list of reference sites please call 1-877-967-2726.